The gaming group is has been pretty irregular over the summer, what with work schedules, vacations, and assorted BS. One of our players is going to start an indefinite AD&D 1e game though — first we’ll try out a module with 5th level PCs and if we’re enjoying it, we might continue with him as DM for as long as he can stand our shenanigans. So we each making two PCs, and naturally one of mine will be a half-orc fighter-assassin. 4th/4th then, and any equipment normally available in the PHB, but no poisons, elfin mail, strong bows or magic, as those are all the purview of the DM. Sticking to BtB AD&D 1e, with only the MM, PHB, and DMG should be interesting. That’s how I started D&D thirty+ years ago. But who can resist poring over the books looking for a loophole? Not I. So I discovered some obscure AD&Disms that I had mostly never really understood or taken note of before. ITEM: Belladonna and wolvesbane. These two herbs are for sale in the PHB and easily overlooked. 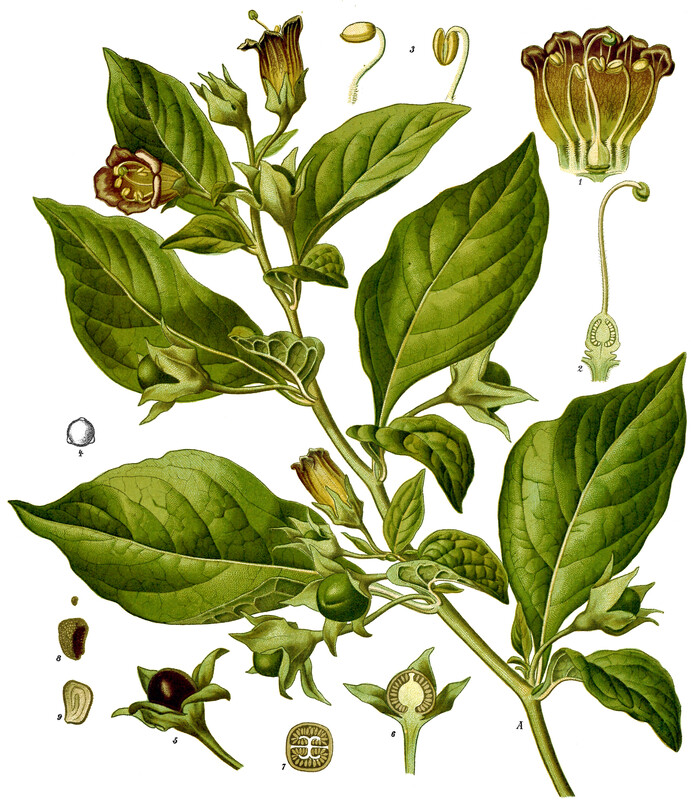 In the real world, both are poisonous — belladonna (or “deadly nightshade”) is the most toxic European plant, and a single leaf or a handful of berries could kill, though it was also used medicinally and cosmetically. Wolfsbane is also poisonous if eaten, but you’d need to eat a fair amount. Belladonna was also supposedly used to make arrow poison at some point in history but I forget by whom or how effective it was — even I would not push that. Anyway, Gornor stocked up on a few sprigs just in case he could feed it to something or someone in the game. But then I started looking for rules related to them and I found that the MM and DMG both give somewhat contradictory information about how they are used to prevent lycanthropy. The important bit for an assassin is: eat some belladonna, and there is a very small (1%) chance you’ll die. But in any case you will be incapacitated for d4 days! (MM, p. 63) I assume that is a very bad trip, given belladonna’s reputed hallucinogenic properties. Still, no save is mentioned, so that makes it pretty useful. There is no explanation of how wolfsbane drives away weres as it does in B/X. DMG p. 220 only mentions that it is reputed to be a sedative and drive away werewolves. NPC clerics use it (along with belladonna) in lycanthropy cures though (DMG p. 22). ITEM: Assassins attacking with surprise and who choose to assassinate rather than backstab automatically cause weapon damage (it is not, however, multiplied as if it were a backstab). So with surprise you might try the assassination table with a chance for automatic death and guaranteed damage, or go for a backstab, risking a miss but causing somewhat more damage. We used to play that you had to make a backstab, and if you hit you roll on the assassination table, or something like that. BtB looks like an improvement. On the other hand the chance of an assassin moving silently or hiding is pretty weak at low levels so you’re really not likely to get a lot of surprise opportunities without careful planning. Minor typographical error: the belladonna info in the MM is on p. 63, not 30.